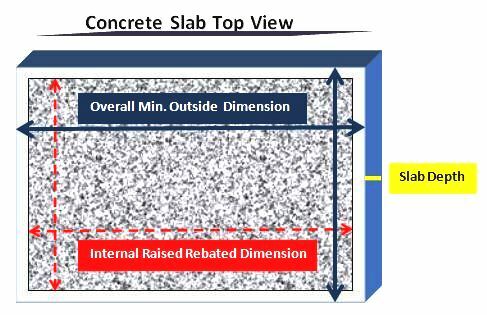 Concrete Slab: Recommended minimum concrete slab dimensions are the external base measurements of this product + 100mm in each direction. 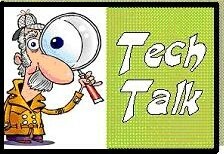 Refer to the "Slab Snapshot" information found under the Tech Hub - How To, section of this product page. 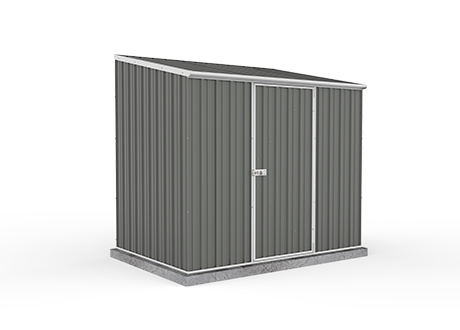 From Australia’s leading and largest garden shed manufacturer – Absco, we are happy to offer select sheds from their Eco-nomy Range. Innovation has long been the cornerstone behind the Absco brand success & now the company has furthered its ethical practices & has produced this new to market “Eco-nomy Range” of shed. The Eco-nomy Range promotes Absco’s goal of providing Australia’s & the World’s best outdoor storage solutions using materials with a reduced environmental impact. The Absco Eco Range of garden sheds…..GO GREEN! These initiatives promote the Absco goal – to impart a smaller environmental manufacturing footprint. The garden sheds are manufactured from strong, low maintenance ribbed steel sheeting and are designed to add value to your home. 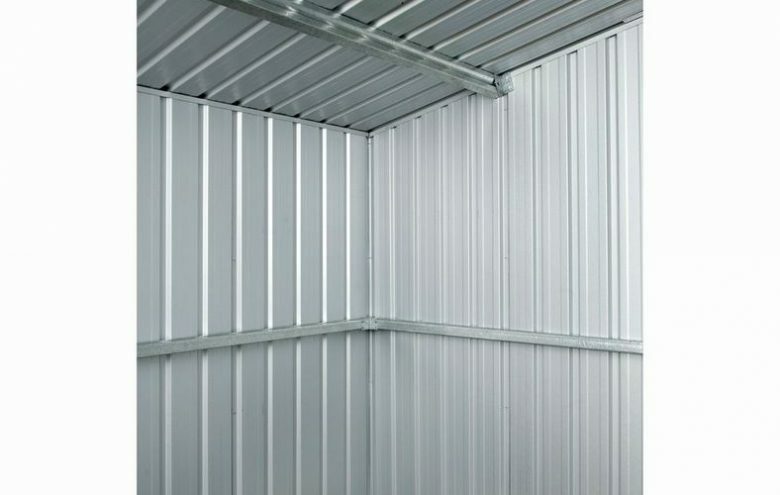 The Economy range of garden sheds offers several sizes & all have the unique and patented SNAPTITE assembly system, as well as reinforced and cross braced hinged door(s) and rolled safety edge metal roof and wall sheeting. 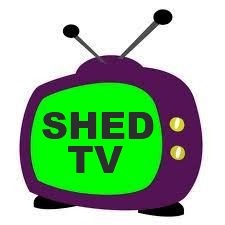 Eco-nomy range sheds are offered with a comprehensive written 10 year manufacturer’s warranty. 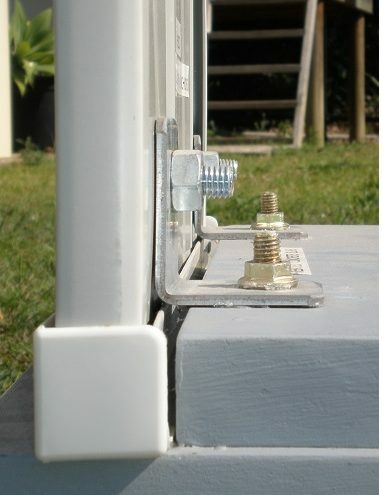 The bolt down anchor kit(s) enable a secure & recommended fixing to a concrete slab or pre-cast concrete paving blocks. Each of the fixing anchors in the pack are made up of 3 components. (1) A 50 x 45mm galvanised “L” shaped steel angle bracket, (2) A 10mm nut & bolt to secure the “L” shaped bracket to the wall of the shed, and (3) A 10 x 50mm dyna bolt to fix the “L” shaped bracket to the concrete slab. 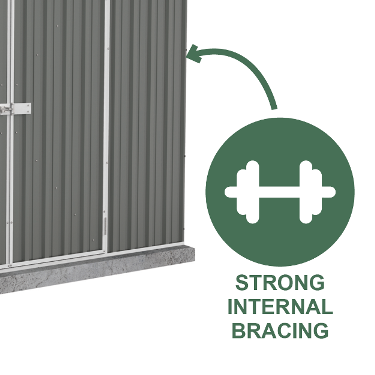 The manufacturer recommends the use of these anchor kits (in their required & shed size specific quantities), to achieve the stated compliance wind rating of this shed or aviary. The number of kits needed will be shown in the “Options & Accessories” selection area, when you complete your order. Absco windows are made up of two clear perspex panels or panes, that slide along a moulded plastic frame. It allows access for natural light & ventilation. 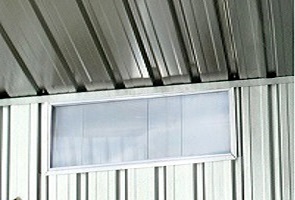 To fit, a single wall sheet requires a single horizontal cut. This is done to create the void into which the window is fitted. The trimming of the wall sheet is done at the time of assembly & installation of the shed, by the purchaser. Its is not accommodated by the manufacturer. The window sits in the space on top of a cut down wall sheet. The window fits immediately beneath where the wall meets the roof. It is recommended that the window be fitted in the wall panels of the shed that have a roof section that overhangs where the wall & roof meet. They should not be fitted in wall panel sections where the junction of the wall & roof, is flush (no-overhang). 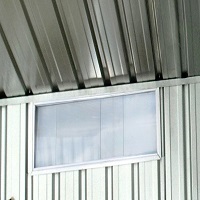 This is to minimise the possibility of water/weather penetrating the shed by running down the face of the wall above the window and through the window frame. The Ozline modular timber flooring kits are made from 100% renewable plantation pine. They are ACQ treated to stop decay and termite and other insect attacks. They are safe to use and dispose of, as they are arsenic free. Each flooring Kit produces a flat surface area of 1520mm x 780mm. By simply joining the assembled flooring kits together, you are able to cover just about any size or configuration needed for a shed, aviary or flat working space. 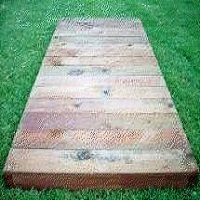 The timber floor is also portable, making it ideal for temporary erection of garden sheds or moving around outdoor furniture. Ideal for renters. 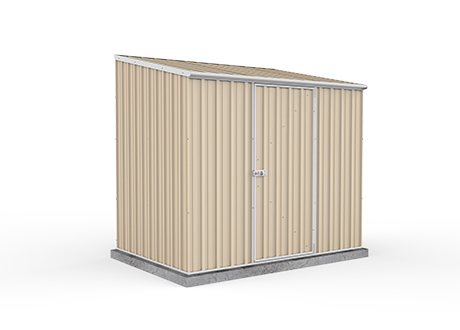 Designed In Modular Sections – The Assembled Kits Can Be Joined Together, Where More Than One Module Is Required To Complete A Floor For Your Size Shed. The Floors Form A Sturdy Timber Base For Your Your Shed Or Aviary To Be Fixed Down To. The Ozline Timber Flooring Kits, require assembly. 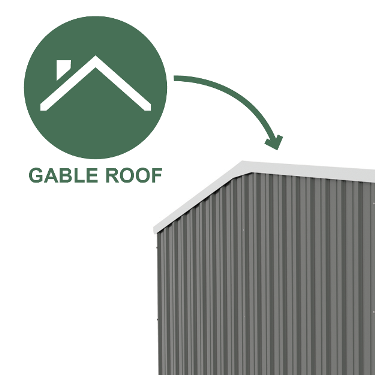 The Kit Contains Pre-measured, Pre-cut & Pre-treated timber and Are Manufactured For Absco Sheds. 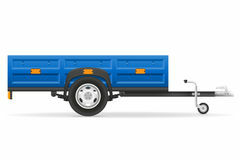 The Kits Are Easy To Assemble (all screws & fixings provided) and Are Offered With A 10 Year Manufacturer’s Warranty. ►Safe ACQ (Arsenic Free) Treatment ► Rot Resistant ► Termite & Insect Resistant ► Fungal Resistant ► Portable ► Raises Shed Off The Ground Approx. 86mm. The flooring kits are modular to allow for multiple kits to be joined together to provide the required base size for your shed. 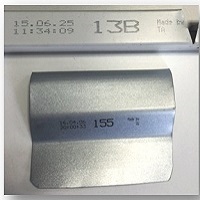 Each kit (single module) forms a base size of 1520mm x 780mm. The Number Of Kits Required Will Be Shown In The Options & Accessories Selection Area, When Completing Your Order. 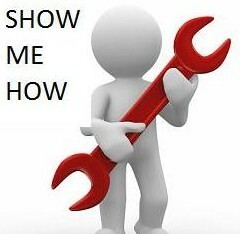 Most garden sheds are engineered to a W41 / or N3 wind rating (ie. Up to 147klm/hr winds) when securely anchored to a concrete slab. In high wind or exposed areas, it is recommended that a concrete slab be used as a base. Most Absco sheds are designed to a N2 wind rating. Where W50C (C1) wind ratings are required, an optional cyclone conversion kit may be fitted for the product to attain this wind rating. They upgrade the engineered integrity of the shed to withstand winds from the standard 147 klm/hr to 180 klm/hr. 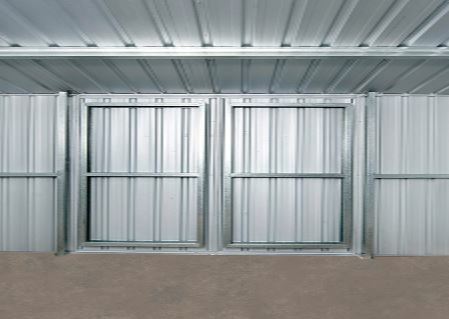 These kits are made up of galvanised heavy duty internal metal frames & brackets, to provide additional bracing. They include all required bolt-down masonry anchors. The Cyclone Conversion Kit Is Easy To Install, With Most Sections Pre-Cut To Size. The Absco Cyclone Conversion Kit Is Fitted After The Final And Standard Shed Assembly. 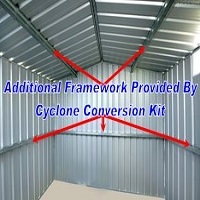 Cyclone conversion kits are supplied in various size categories. 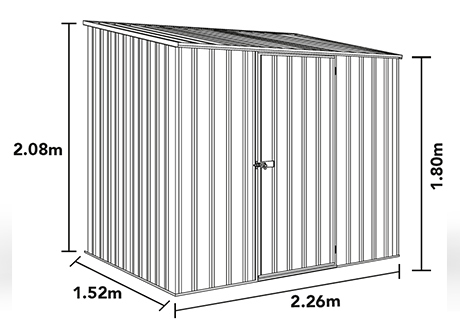 Applicable options for this size shed Will Be Shown In The Options & Accessories Selection Area, When Completing Your Order. 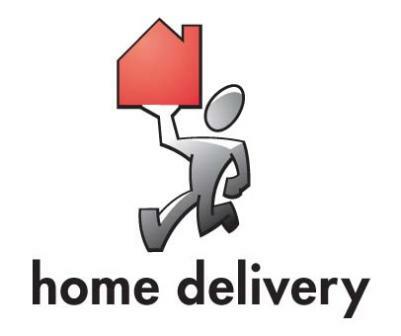 Where Applicable – It Is Essential That The Customer Applies For & Obtains Written Building Approval From Their Local Authority/Council, Before The Purchase Of This Product. This Is To Ensure That The Product Has Been Deemed Suitable & Compliant For The Specific Installation & Use At That Address. 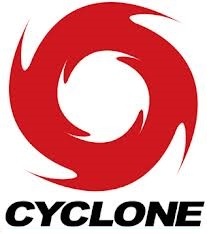 Please Note: These Upgrade Kits To Convert To W50 (C1) Cyclonic Compliance, Are Not Available For Use On All Models. 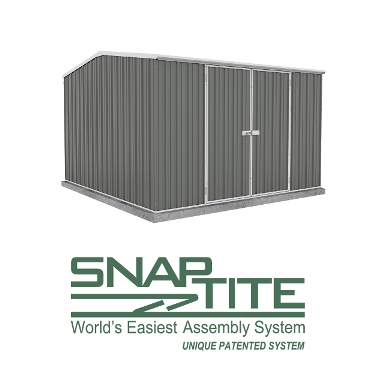 This Absco shed employs the unique & patented SNAPTITE panel assembly system. In the assembly of most garden sheds, sections (such as walls & roof) are put together in panels before they are stood up, positioned & secured together. These panels are usually made up of a number of sheets which are joined together with screws, fixed in the pre-drilled holes. There are also structural top & bottom perimeter channels that are positioned across these panels. This is where the Absco SNAPTITE system comes into its own. Where others require you to drill & screw or rivet the roof or wall sheets to these channels to complete the panel, SNAPTITE eliminates this time consuming step. Each of the Absco roof or wall sheets have a uniquely engineered, pre-pressed series of tabs that receive, clip & lock into the purpose formed top & bottom channels. 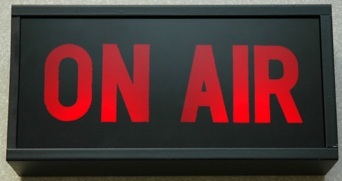 This is done by using your hand to tap the channel to lock it in place. No tools or fasteners required for this step. The manufacturer recommends that a suitable concrete slab be provided to adequately fix to and secure the assembled structure. (Refer to the product assembly manual). The selected site for your concrete slab should be provide drainage away from the shed to minimise moisture continually being drawn into the porous concrete, which may promote the formation of condensation inside the shed. Concrete slabs are typically 100mm deep & provide a flat & level finished surface for the shed to sit on & be secured to. As a rule, minimum slab dimensions recommended are – the shed external footprint + 100 mm in each direction. This will give a 50mm border right around a centre-positioned shed. This 50mm concrete border should have a downwards chamfer (by at least 10mm), so as to allow any water run-off away from the shed walls. 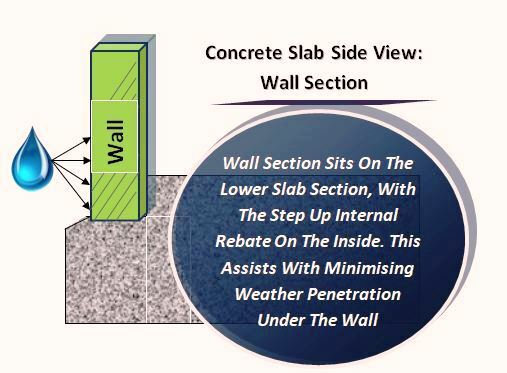 Internal Step-Up Rebates for Concrete Slabs (Optional): Used to create a physical barrier that acts to assist in keeping out some of the weather that may otherwise find its way coming into the shed at the base, where the wall meets the slab. Here, the part of the slab inside of the shed, is raised (approx. 15-20mm) higher than the outside section of the slab where the wall sits. 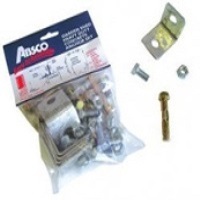 Bolt Down Anchor Kit (8): # Required - x1 +$49(Set Of 8 : - Brackets, Nuts & Bolts, + Dynabolts) Once selected - multiple quantities can be set in the "Order Summary" section below. 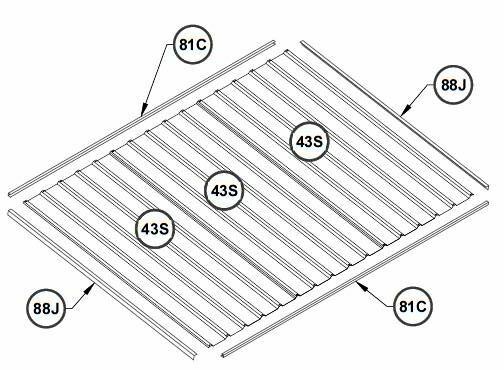 Sliding Perspex Window (SLPW) x1 +$125(220mm H x 700mm W) Once selected - multiple quantities can be set in the "Order Summary" section below. Modular Timber Flooring Kit(s) (OZKIT): # Required - x3 +$477Kits Require Assembly. Each Kit Creates A Single floor - 1520 x 780 x 86mm. The number of kits required to be purchased & joined together to form a base for this product is shown here.